Get ready for some good ol’ fun down on the funny farm! 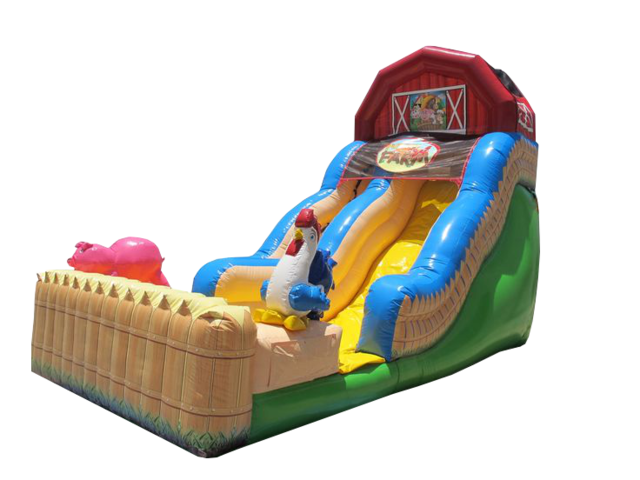 Your party guests will go hog wild for the fun barnyard-themed Funny Farm Inflatable Water Slide. This cheerful and bright slide features a large rooster and pig perched atop a country picket fence. Party guests slide through the big red barn at the top, down a colorful yellow and blue water slide and down into the grassy farm yard with the animals. water slide and cotton candy machine. Here's video of this inflatable water slide.